I'm not too sure if a lot of people are aware of this but I love fashion! What girl doesn't? Don't answer that! I didn't always love fashion but I always enjoyed putting things together no matter what the outcome. I just always hoped for the best! A couple of weeks ago I was lucky enough to come across Too Fast Clothing and QUICKLY fell in LOVE with their online store. Sooo of course, I had to share! 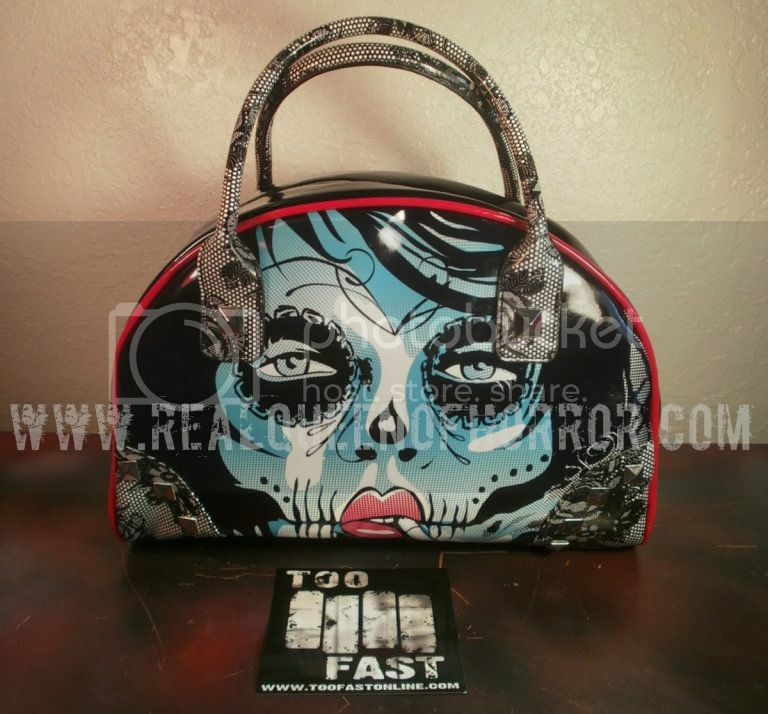 Too Fast Clothing is such an awesome store with top quality alternative clothing & accessories from all over the world! I was so impressed because there are clothes here I've never seen before. I also found out that they have different types of artist that help create their clothing designs. Nothing ticks me off more than seeing someone else wearing what I'm wearing! I like to be unique! And Too Fast Clothing indeed has uniqueness that screams REAL QUEEN OF HORROR...review! So, yeah, here it is! 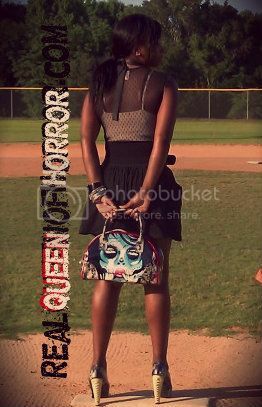 If I genuinely adore something, it shows up on Real Queen of Horror DOT com! I saw many things that I thought was so awesome but I ultimately fell in love with these TWO items! 1 inch platform, 5 inch heel! Yes! These shoes are beautiful in every way! Peep the spine heel!! Yes...I know, perfection. I just may wear these on my wedding day...I'm not too sure yet! 13 inches long X 9 inches tall X 5 inches wide. It's an amazing vinyl bowling handbag, with black lace print accents, satin lining, an inner pocket...it's even pretty on the inside with satin black lace print! I've NEVER seen a bag like this one and was intrigued by the artwork! I say she's an intense zombie chick! Artwork by Carissa Rose! No worries, Too Fast Clothing isn't only for women. They also sell men's clothing! Not only that but they sell gift cards, offer gift registries, and maintain an awesome site that's very easy to use. Enjoy my mini commercial/review on Too Fast Clothing! I love Too Fast! They carry so many amazing brands such as Iron Fist, Loungefly and Lux De Ville, of which I have a handbag from all 3 :D I love the lace print handles on that handbag and the sugar skull.. eeek! Their accessories section is so drool worthy.. I wish I could buy it all! Argh why do things have to cost money?!?!?! Those shoes you purchased are amazing! I've seen a few spine heeled shoes floating around on the internet but those ones have the most awesome spine chilling print all over them! Yum! ... making me want to spend money :( HA! "Look at her" "Look at her!" Hahaha! The only problem with sharing your awesome finds with us, is that you might not be so unique anymore... I might just have to get that purse! We're in different states so it won't get awkward. ;) As for the shoes, I'm always saying that some shoes are works of art and should be on a shelf. Some shoes would only be good as sculptures, but yours actually look wearable too. Are you having kind of a spooky or Halloween themed wedding? I forget when you're getting married. I can't believe that I've never heard of this site before! I can't wait to go visit. At the very least, I'll probably pin a bunch of their stuff to my Pinterest page. I also love the design of the heels! I agree with Justine above; they are works of art! @VainGlorySinner Lol! I fell in love with them instantly and HAD to share! I love all the different brands they definitely have to offer! @Justine Lol! That is VERY true but I had to share! And just as long as I know that I had the item first--and I inspired I'm a happy girl! I'm having a traditional wedding..HOWEVER! I enjoy things with a twist, so people won't be able to see my shoes under my dress, so I may do something a bit spooky, just for me! They usually have great sales too. @Jenny That is so awesome! I think you should. J'adore that bag. Me wants. Just out of curiosity, Zena, what is the price tag on those high heels? They look to be very expensive.